Sarah and I are excited about our Bean Books! for iPhones, iPads, smart phones and android tablets. The story behind the Bean books is a fun one. In August of 1995 Sarah had graduated from UC Santa Cruz and was hoping to begin a career in the childrens book field. Gary and I decided to take her to the Society of Childrens Book Writers and Illustrators National Conference in southern California before she and her husband moved to the east coast where he planned to study illustration at the Rhode Island School of Design. At the time Sarahs older sister Bethany was seven months pregnant and the small apartment where she lived with her husband was ruled by a delightful black cat named Bean. Bean sat in the window, caught balls midair, and fetched them to be tossed again. Sarah and I said, "One of us will have to write a book about Bean and the baby." .but a story. I had an obligation immediately after that and while I was busy, Sarah sketched out a little story board. From that I made a 2 x 2" dummy. We submitted it once and when it came back with encouraging words, we made a small change and sent Beans Baby off to Harcourt Brace, saying we had some other ideas for books about Bean. Editor Allyn Johnston responded almost immediately, perhaps partly because her baby was then quite curious about cats, saying she wanted to see our other ideas. Sarah wrote Beans Games. I wrote a version of Beans Night. Allyn like the first, but not the second, so Sarah wrote a new and completely different Beans Night. I made the dummies and we got the contract for all three. "The biggest problem," Allyn said, "is how are we gong to fit all of your names on the covers of these little tiny books." As I worked on the finished illustrations, Sarah and Nathan visited often, giving me their helpful input. Allyn, her assistant Shelly Bowen, and designer Judythe Sieck also had a lot to say as the work progressed. The title of Beans Baby was changed to Bean to avoid any suggested reference to "Beanie Babies" which had suddenly become extremely popular. but once he became mobile Bean decided that keeping a distance was the wisest way to go. are now on appropo's to-do list! Bean is on the Children's Television Workshops Recommended Reading List for Ages Zero to Three. In these two playful board books, each with a simple rhyming mini-story and cluttered art, a curious cat named Bean leaps, creeps, and snuggles its way in and out of household adventures involving among other things, a ball, a blanket, and a baby. The hero of these three board books is Bean, a black cat. The simple text documents Bean's first meeting with a Baby ("Bean peeks, Baby squeaks. "), his night-time adventures, and his curiosity-driven encounters with the world around him. These three embraceable board books, which track the pastimes of a frisky black cat, are sure to captivate preschoolers. The text is so succinct - it comes in two word spurts - as to sound almost percussive. In Bean, the cat must come to terms with a new household member. It's no longer a matter of "Bean's window" and "Bean's ball"; now that Baby is in the picture, it is a toss-up who'll prevail. The soothing solution - "Bean's baby" - might help to placate balky neo-siblings. Bean's games (from "String Bean" to "Peek-a-Bean") are supremely silly, and Bean's night is a playful prowl. Anna Hines is a veteran author-illustrator, and in this, her daughter's first venture as a writer, her clear, simple imagery is a perfect match for punchy pared-down text." A simple text accompanies double-page spreads that show Bean, an appealing black cat, engaging in various activities. Some of the humor may be over the heads of the intended audience. For example, in one scene ("Bean bag"), the animal's head is hidden inside a paper bag. 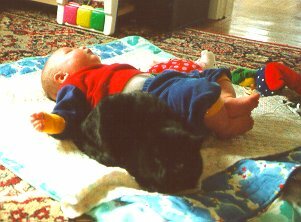 Young children may not get the idea of "Human Bean", showing the cat lying in a person's lap. However, they will still be able to follow the action and enjoy the brightly colored paintings. They will also be drawn to the small size of this board book, which makes it perfect for exploring with their eyes and fingers. Pennsylvania author/illustrator Anna Grossnickle Hines has never lost touch with what it feels like to be a toddler or preschooler. It's a magic touch that allows Hines to create such picture book classics as Daddy Makes the Best Spaghetti and All By Myself. Now Hines has combined forces with her grown daughter, Sarah Hines-Stephens, to create a marvelous new series focused on a green-eyed, black-furred cat named Bean. Hines-Stephens writes the stories and her mother illustrates them, and together they have created a board book series that is guaranteed to tickle your toddler. In Bean, young readers are introduced to the whirlwind of activity that is Bean. What's particularly great about this book is Hines-Stephens' decision to pair Bean with a baby, a lively combo that produces some of the small but dramatic adventures that babies and toddlers love. 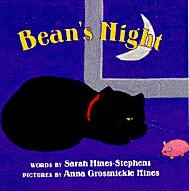 In Bean's Night, Hines-Stephens uses a lilting rhyme to detail how Bean plays all night and sleeps all day. Bean's Games has a similarly clever text as Hines-Stephens uses fun puns to describe how this energetic cat plays. is the beauty of board books. Children far too young to read words can look, touch, feel and ogle over board books without destroying them and in the process, begin to develop an attachment and love for books and reading. These three Bean books incorporate the most simple story line with happy, colorful illustrations. The central character is Bean - a black cat with beautiful green eyes. 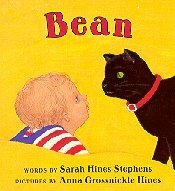 In the first book of the series, Bean, children are introduced to Bean, where Bean lives, the baby Bean lives with and how the two interact and love one another. 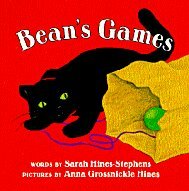 In Bean's Games readers see Bean jumping, playing with a paper bag and string, and other mischief Bean gets into. Happy, lively books for the tiniest reader in your life, babies and toddlers will love reading about this charming cat while they enjoy a positive introduction to the wonderful world of the written word. In Bean the reader meets Bean the cat and Baby - as Bean and Baby meet each other. In Bean's Night the reader follows Bean in his nighttime escapades. And in books three, Bean's Games, Bean has his games while the reader enjoys the word play. The stories about this playful velvet-black cat with the lime-green eyes came into being shortly before Jacob was born - making Sarah an aunt, and Anna a grandmother for the first time. 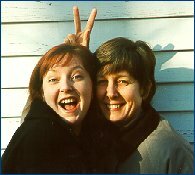 A delightful mother-daughter collaboration. And these 4 1/2 inch by 4 1/2 inch books fit little ones just right. Tricia Gardella, The Union Democrat (Sonora CA). Bean, the black cat, is a curious creature who enjoys playing solo, investigating the inside world of his human family's house, and interacting with the family's baby. To Bean, everything becomes an intriguing adventure in which there are no worries or troubles. Every simply designed scene easily imparts Bean's impish point of view and is quickly described in just a word or two. Toddlers who are familiar with cats will especially find Bean amusing. Great book for babies and toddlers! I purchased this one and the others in the Bean series for my 9 month old. She loves the illustrations, they are bright and colorful. I've been reading them to her nightly and she is now anticipating the next page and can recognize, the baby, and Bean. I highly recommend. My 12 month old daughter picked this book up and hasn't put it down now for 6 months. It is her favorite book, she loves the cat pictures and reads along with us. Its the perfect book to start early readers on, with just enough words and engaging pictures. Bean is the first book our 2 year old wants to "read" aloud to us. She loves to see Bean bound around the house in different situations, chasing string, hiding in the closet. It will make you want a little black bean cat of your own.